Leipzig: An international team of researchers has made important progress in understanding the distribution of the deadly amphibian chytrid pathogen. In some regions, the deadly impact of the pathogen appears to be hampered by small predators, naturally occurring in freshwater bodies. These micropredators may efficiently reduce the number of free-swimming infectious stages (zoospores) by consuming them. This natural behavior will reduce the infection pressure on potential amphibian hosts and a goes a long way towards explaining the occurrence of chytridiomycosis, at least in temporal climatic regions. These results were published in the renowned scientific journal Current Biology. The team of researchers state that their results raise the hope of successfully fighting chytridiomycosis, nowadays one of the most deadly wildlife diseases. The entire class of the amphibians is greatly affected by the current wave of global extinctions. Although anthropogenic habitat alteration and fragmentation are the most important causes of amphibian biodiversity loss, mere conservation of amphibian habitats no longer guarantees amphibian survival. Indeed, the introduction of infectious diseases has been shown to drive amphibians to extinction even in seemingly pristine habitats. "The current amphibian decline is a disaster for ecosystems around the world" says Dr. Dirk S. Schmeller from the Helmholtz-Center for Environmental Research (UFZ) and the CNRS Unit Ecolab, and adds "Amphibians have key roles in freshwater ecosystems, and when they are gone, far going changes are unavoidable". Chytridiomycosis is a disease which is devastating amphibians around the world. It is caused by the deadly chytrid skin fungus (Batrachochytrium dendrobatidis), or Bd, as scientists call it in short. Bd infects the skin of amphibians, which is an important respiratory organ for them, allowing them to breathe also in the water. "Bd needs to establish in a new environment and has usually a tight time window to infect a suitable host, either an adult amphibian or tadpoles and larvae of this species group", says veterinarian Prof. Dr. Frank Pasmans from the University of Ghent. The midwife toad (Alytes obstetricans) in the Pyrenees. Some populations of this species did resist Bd infection and the pattern of the resistances was a first indication for the researchers that interactions between Bd zoospores and microorganisms are worth investigating more deeply. If Bd successfully establishes, infections will steadily increase and above a certain threshold, amphibians will start dying. In vulnerable species, local extinction can occur. In this manner many species have been lost, especially in Central America and tropical Australia. 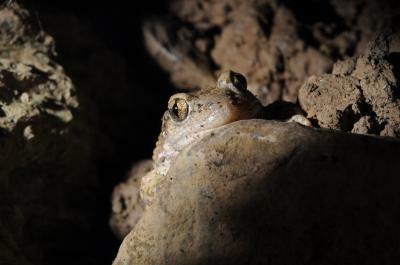 However, this worst case scenario did not occur in all populations of the Midwife Toad A. obstetricans in the Pyrenean Mountains, the main study area of the Biodiversa-project RACE, which intrigued scientists. They started a whole range of experiments, which took over three years to complete, to understand, which differences between different ponds and lakes of the Pyrenees could explain such a pattern. "The infected lakes and ponds did not look like the uninfected ones, neither in regard to the vegetation nor in regard to the geological characteristics" says Dirk S. Schmeller. "When we brought in water from infected and uninfected sites, in some cases with help from donkeys, we saw clear differences in laboratory cultures of the pathogen, as well as in the infection dynamics." *provide a photo of donkeys carrying water* A series of additional experiments than clearly established that some microscopic aquatic predators, such as protozoans and rotifers, are capable of consuming large quantities of the infectious stage of Bd. "The consumption of zoospores reduces the infection pressure for the whole population by reducing the number of infected tadpoles", says Mark Blooi from the University of Ghent. Water bodies that do not support a diverse and abundant micropredator community, such as those that suffer from anthropogenic and environmental pressures, could lead to higher infection rates that lead to outbreaks of disease and amphibian population crashes. Dr. Adeline Loyau from the Helmholtz-Center for Environmental Research and the CNRS Unit Ecolab adds: "The big question to rapidly answer is, if by steering micropredator abundance and community composition, can we alleviate the impact of chytridiomycosis in natural amphibian populations? And if so, does this offer a realistic method for preservation of amphibians in Bd infected areas around the world." The work, conducted by an international research team financed by the Biodiversa-Project RACE, raises the hope for an effective biocontrol against the Chytrid fungus, one without the downsides associated with introducing nonnative biocontrol agents, such as the use of antifungal chemicals or release of nonnative skin bacteria into the environment, or the reliance of unpredictable environmental temperature to ''cure'' infections. The study also contributes to a better understanding on how ecosystem health is linked to the establishment of pathogens in new environments, as only in healthy ecosystems the community of microorganisms might be able to consume zoospores effectively. The results have been published in the January issue of Current Biology. Ibón Acherito in the Spanish Pyrenees. The researchers collected water samples there to better understand the current distribution of the pathogen Bd. The lake is on an altitude of about 1900 m in the Western Pyrenees and contains a large number of different amphibian species.